Here’s a look at what I wore yesterday out and about with my little bug (as you probably saw on my instagram)! I definitely had a ‘thing’ for buffalo check and gingham this winter, but I love this shirt from TopShop for spring! The ruffle detail adds a fun, feminine flair and you can never go wrong with a floppy hat. ;) Have a great weekend! I love the sweet edginess of this look! The roses add such a pretty touch, and as always I’m obsessed with those shoes! Red looks amazing on you! I love the subtle amount of it in your top, especially paired with that amazing bag! 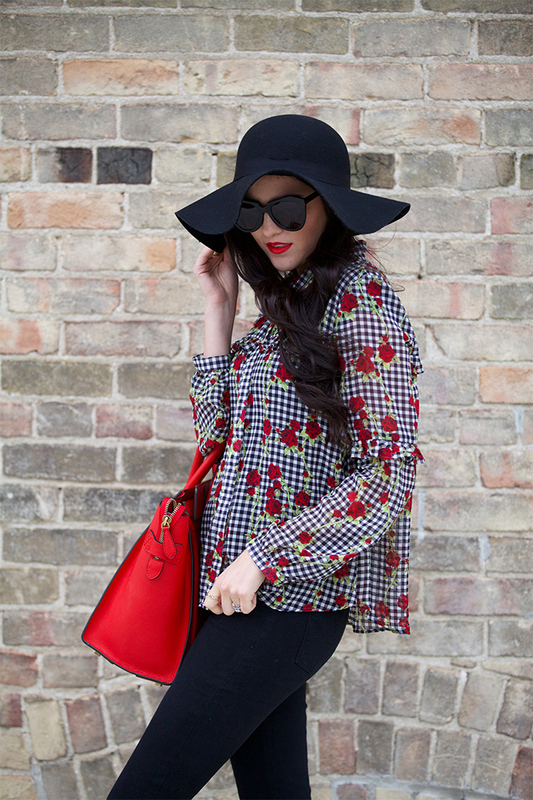 Such a great top, and I love that hat and your gorgeous bag! 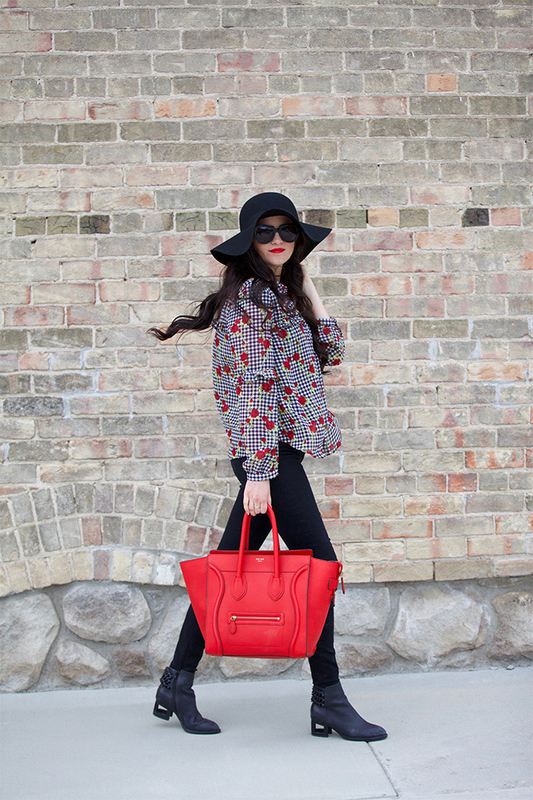 Love your red Celine! Happy Friday! So pretty! I love your hat! Love your top, the roses are so cute! I love the bag! Nice look. Pretty look! Such a cute blouse!! 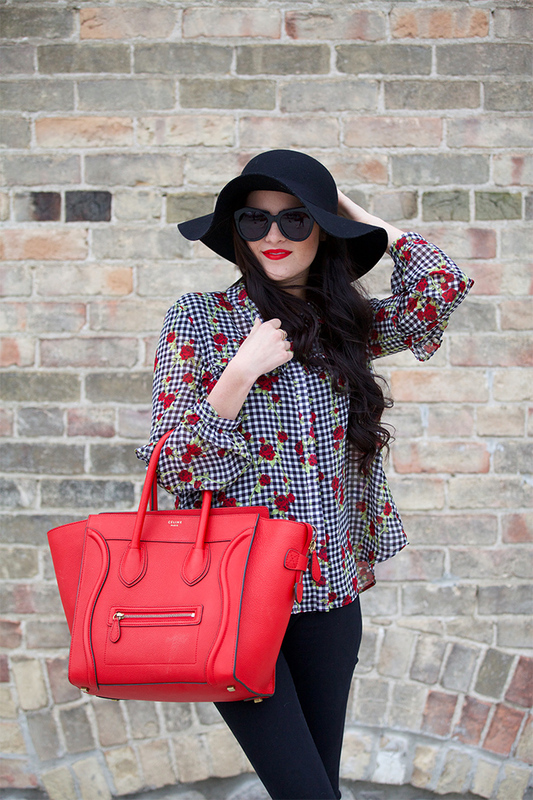 Love that gorgeous red Celine bag paired with the gingham floral top! It has me excited for spring! You look beautiful! Have a great weekend! Looking superb in this outfit! Your blouse is such a lovely, romantic piece! You rock those floppy hats! I recently discovered a Top Shop near me and I totally love it! P.s That bag is killer! That hat is so cute! It really goes well with your outfit! This hat looks fabulous on you! 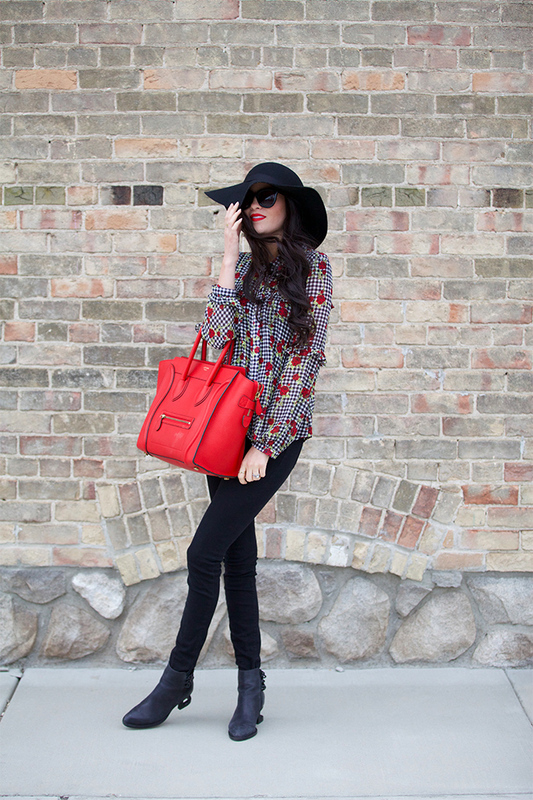 Love the red lipstick with the red bag. Beautiful top! Love your style! That bag is so beautiful! You are so lucky! Everything about this outfit is perfect, you look incredibly chic! 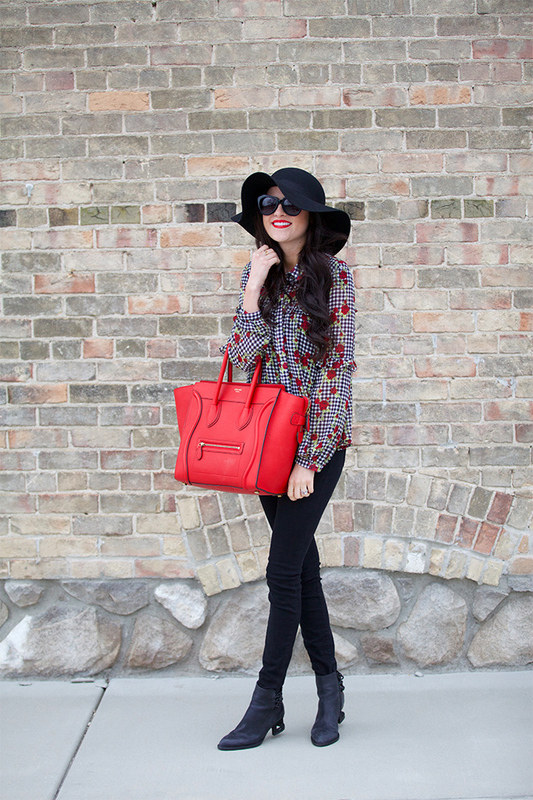 I simply adore the way you’ve styled your blouse and those booties are GORGEOUS! Thanks so much for sharing, beauty, and I hope you have a lovely weekend! 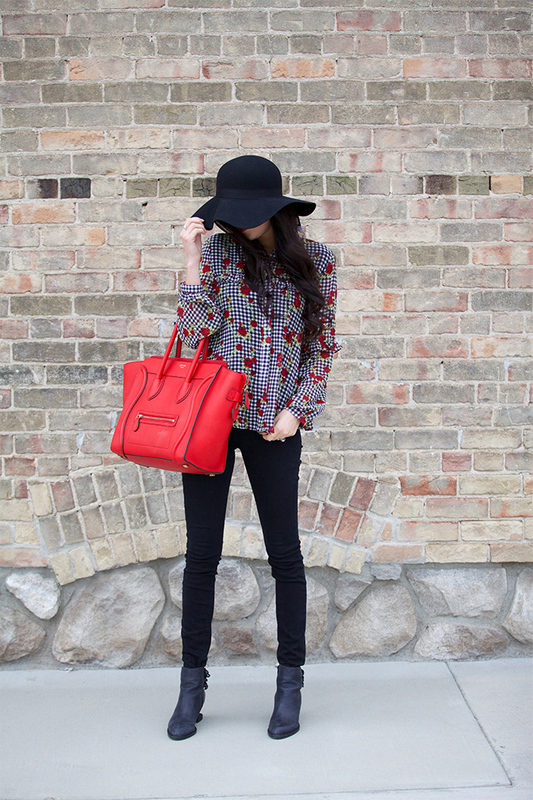 Absolutely love the red Celine bag picking up the roses in your shirt, too cute! Also OBSESSED with your black hat! Adore this post! Amazing pictures! Effortless! I love it! The touches of reflow great on you! Beautiful outfit, I love your Céline bag!! You look Gorgeous ! and Red looks amazing on you! I really love the top and those boots are fabulous!!! Ah I love this outfit! I adore how you matched your tote to the colour of the roses on your shirt! Gorgeous! This top is amazing. I love the gingham and roses together. Very unexpected yet chic. Love this look! 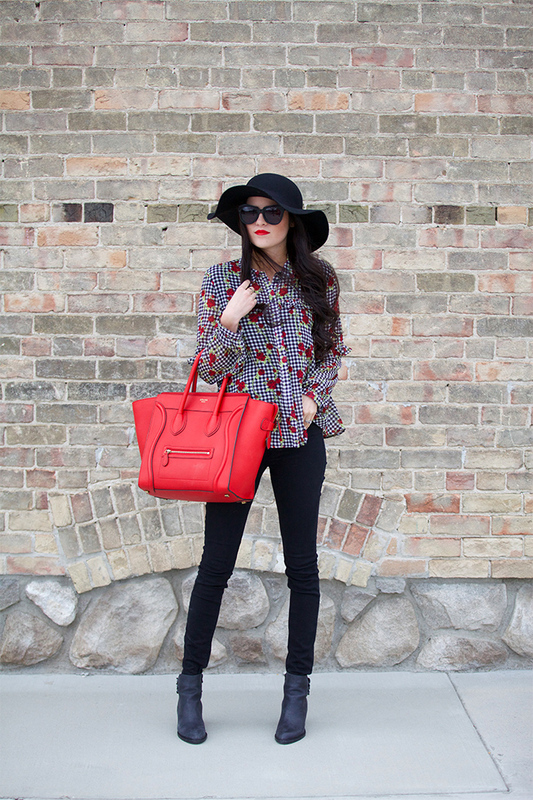 The hat, oversized glasses & red floral give it a girly flare, while the buffalo check, booties & Celine bag bring in an edgy touch. Love how simple yet stunning this look is. Cute outfit! Loving the bright red bag too. What a fun mix of prints!